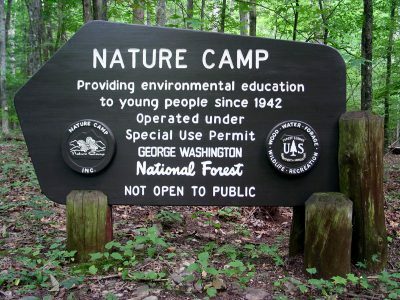 This year, several local organizations have combined their application process to streamline submissions for scholarships to the 2019 sessions of Nature Camp, nestled in the Blue Ridge Mountains of Rockbridge County, VA. Students who will have completed 5-12 grade next June are eligible to apply. These scholarships are intended to support students who truly have an interest in learning about the natural world and who can work and learn both independently and in groups. Nature Camp is unique in its academic focus. Since it began in 1942, this camp has emphasized hands-on, field-based, experiential education in natural history and environmental studies. Selected campers will be required to attend daily classes, to take notes and to maintain a notebook, to complete all written assignments, and to participate in outdoor activities in all types of weather. Campers will be expected to accept academic challenges with enthusiasm, commitment, and hard work. Those who have attended in the past have discovered the joy of learning about nature and have often returned the next year for more of what Nature Camp has to offer. The camp has taught students to love and protect the environment through its hands-on learning approach. The applications must be postmarked by November 13th, 2018. Please consider joining other students like you who love the outdoors and want to learn how to make an environmental difference.